The Gulf Coast Bigfoot Research Organization (GCBRO) is convinced that not only is there a Bigfoot, but there are in fact bigfeet scattered across the countryside, even as many as 30,000 creatures (a number they admit is a “wild guess”) from the Pacific Northwest and across the South from Texas to Georgia…. The so-called “Monster Central,” about 1500 acres, 30 miles south of Shreveport Louisiana, is actually on Landsdale’s property, where he first laid eyes on a Bigfoot 20 years ago and where the GCBRO does many of their hunts. They’ve most recently spotted a female bigfoot along with her child, though since the GCBRO team only wants to harvest a male specimen, they didn’t pursue. Landsdale says these are sharp, corn-feeding creatures, but they can also be fearless. When the creatures allegedly started killing Landsdale’s pets, he resolved to kill one for study. The Toledo Bend Reservoir, on the Sabine River between Texas and Louisiana near the city of Natchitoches, is a prime area for Bigfoot sightings, sometimes generating two reports a month. The GCBRO has seen “packs” of Bigfoot here, roaming across four or five parishes. The GCBRO says they receive anywhere from three to five reports a week from up and down the river and its tributaries in the Mississippi Wildlife Management Area (WMA). Other times, an entire month will pass without a report. Based on this and other evidence, the group has concluded that Bigfoot individuals and families of up to 10 creatures are probably hunting in geographic loops on a roughly 72 hour cycle, originating from their bedding area, moving to various hunting grounds, and back to their bedding area. As with much of the South, it’s theorized that Bigfoot prefers this area for the climate and abundance of vegetation and animals. This area is best known for the Fouke Monster, aka “Southern Sasquatch,” near the town of Fouke in Miller County, Arkansas. A book and a number of films have been made, based on this legend. Fouke was the first known variety of sasquatch, with only three toes (Bigfoot species can have three, four or five toes), and are aggressive, prone to killing pigs and terrorizing people. Landsdale believes the three toed creatures may be inbreeding, making them more aggressive than their four and five-toed cousins. The west coastal areas of Washington State have several reports of sightings, including Kitsap County, which has had quite a few sightings in 2014 alone, as well as Bumping Lake and Skooum Valley. The coast is said to be preferred by these sasquatch for the climate, as it’s never really hot or cold, and there’s plenty of available vegetation and meat. Again, the sasquatch in this region tend to be less aggressive, more likely to be loners, and stay away from people. Bluff Creek is famous for the hotly debated Patterson film, showing footage of “Patty” in 1967. Since then, male tracks have been found in the snow in the area. Caves provide protection from the elements between hunts, which persist all winter, as Sasquatch don’t hibernate. Images of Dyer’s kill began circling the internet this week, and it wasn’t long before mainstream outlets like TIME magazine were giving valuable press to the “man who shot Sasquatch”, running stories about how Dyer baited the beast with Wal-Mart ribs nailed to a tree outside San Antonio. He claims that after the big guy was studied (we’re never told by whom), his body was stuffed and preserved. Now Dyer is touring the country with the dead body in the back of his trailer, charging curious onlookers a few bucks a pop for a peek behind the curtain. If this all sounds a little, well, fake.. that’s because it is. What the media isn’t mentioning is that this isn’t the first time that Rick Dyer has “killed Bigfoot”. 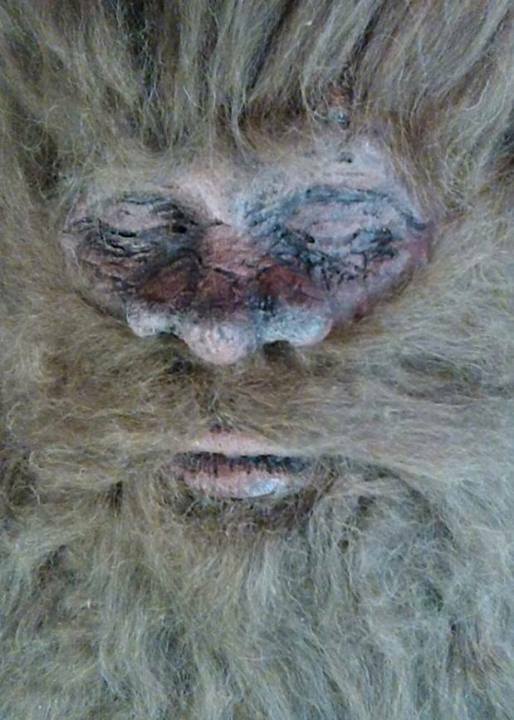 Monster-hunter Rick Dyer claims he shot and killed Bigfoot — because that’s what you do when you find a shy, rare creature — and is now touring the country with its dead body. Today he released this picture of his Bigfoot trophy. Read more at Cryptomundo and judge for yourself.